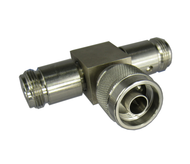 We currently offer coaxial resistive power dividers (aka power splitters), which are inherently broadband and have excellent low frequency response (0!) albeit with poor isolation; and also Wilkinson Power dividers, aka Wilkinson Splitters. The resistive power splitters are implemented with tiny resistors. Wilkinson splitters can be microstrip or stripline. 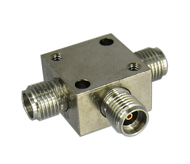 RF Power Dividers are often lumped element, Microwave Power Dividers are often microstrip. 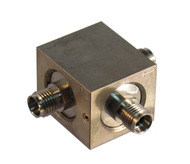 Parts available here include sma power dividers,type n power dividers, 3.5mm, and 2.92mm power dividers. SMA power dividers are available in many configurations. The power dividers can also be used as power combiners but power handling would be greatly reduced, one might consider hybrids or duplexers instead for combining signals.